Wow! Well it's certainly been a whirlwind for LarabeeUK this year, I sort of re-launched back in March after a patchy couple of years 'playing' at being a blogger and having no direction. I say re-launched what I actually mean is started consistently blogging, having a blog plan and having a vision of where I want to be. By March this year I hope to have a big re-design complete for LarabeeUK's first 'proper' anniversary. I got back on the wagon after joining in with the #simpleplay challenge over at nurturestore.co.uk which then lead me on to participating in the #wmlplayeachday challenges on instagram, I found that instagram wasn't allowing me to express myself enough and so I made the leap to start again. I am so glad that I did, although sometimes I feel like death from being up late at night blogging I am really enjoying doing the projects and activities, creating recipes and joining in with the blogging community and the things which are needed to generate fresh and original content, I'm absolutely loving every moment. It's been a challenge to keep up momentum when I've been busy at work and something has always had to give, sometimes it's been the blog, sometimes it's been housework (not a bad thing!) and sometimes it's been my personal time, being a part-time blogger is hard, but I'm learning to grab moments where I can. The great thing about being a parent blogger (which is what I see myself as!) is that the majority of posts are based around spending time with my family so I need to do that more to create these posts, win-win! 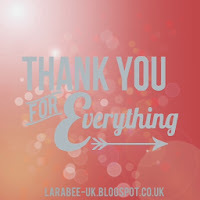 I wanted to write this post to say a massive thank you to all my readers, thank you for following, thank you for commenting - it really means a lot even though I don't aways reply in a timely manner! Thank you for liking, thank you for +1-ing and thank you for tweeting. Oh and by the way I could do with some more Facebook love if you wouldn't mind giving me a like! There are a couple of people I really want to say a special mention to, each for different reasons but each for their support and encouragement over the past 9 months. First thank you Mary over at over40amdmumtoone, thank you so much for your kind words which really helped me get motivated and kept me blogging, I hope you remember what I mean! Thank you to Jocelyn at The Reading Residence a great inspiration to me and someone who has re-ignited my love of paper and books which I'm passing on to T.
Thank you to Grace at Eats Amazing and Gemma at Expat Family Q8 who inspire me to keep feeding my little man healthy but fun food. Gemma also has a fantastic business making wonderful children's craft products in Kuwait and can be found over at kidscraftkuwait on Facebook her invitations to play are second to none! A massive thank you to Becky at 3 Princesses and 1 Dude who is just the best blogging buddy anyone could ever have, thank you for everything, for making me laugh constantly, for your friendship, everything you do is such a support on this crazy journey. Thanks also to everyone who links up to our #toddlerapprovedtuesday linky, your support is very much welcomed and I am blown away by the variety of ideas we have received, let's make 2015 the year this linky gets popular! And finally thank you to everyone who have participated in the #kidsstickerswap, this was my big baby last year and I've had a ball hosting and running the swaps, thank you, thank you, thank you. Look out for some more from #kidsstickerswap this year and a few new features. Thanks Louise, it has really.